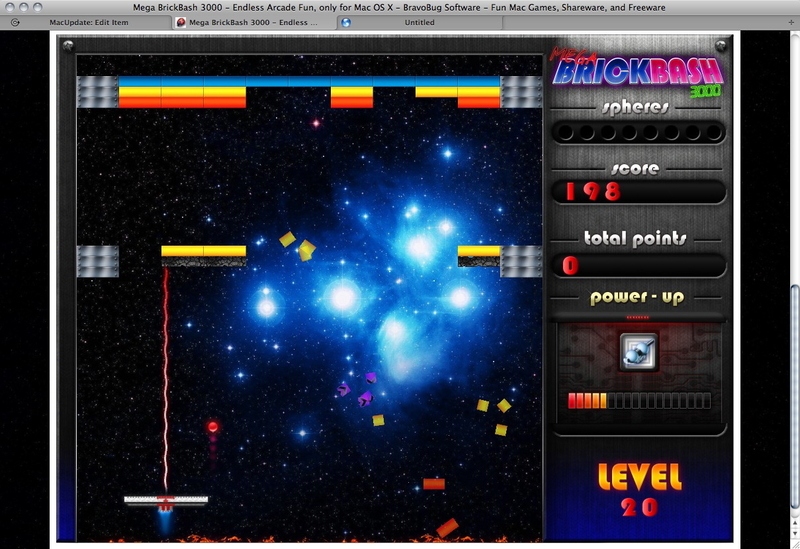 Breakout brick bashing arcade game with 100+ levels and level editor. Is there a better alternative to Mega BrickBash 3000? Is Mega BrickBash 3000 really the best app in Arcade category? Will Mega BrickBash 3000 work good on macOS 10.13.4? Mega BrickBash 3000 is a game in the year 3000, and you are working at a deep space construction site when somehow your platform ship drifts off course. You find yourself trapped in an alternate dimension, surrounded by strange power structures and bouncing energy spheres. What a lucky coincidence then that your spaceship is in the shape of a giant paddle! Perhaps if you smash your way through the brick-like structures that surround you, you'll find a way to get back home. This new version of MBB3K contains changes to many of the end-game levels in the full game set (about 20 levels have been improved for better playability, pacing, and difficulty). Mega BrickBash 3000 needs a review. Be the first to review this app and get the discussion started! Mega BrickBash 3000 needs a rating. Be the first to rate this app and get the discussion started!